Hypoparathyroidism results from defective synthesis or secretion of parathyroid hormone (PTH), end-organ resistance, or inappropriate regulations that result from the activated or antibody-stimulated calcium-sensing receptor (CaSR). These defects can be inherited or acquired. PTH secretion by the parathyroid glands (prime regulators of serum calcium concentration) maintains serum calcium within a strict range. Biochemical hallmarks of hypoparathyroidism include hypocalcemia and hyperphosphatemia. Severe hypocalcemia presents with seizures, stridor, prolonged QTc, and tetany. Mature PTH is an 84–amino acid protein. Production and secretion of PTH are regulated by a G protein–coupled calcium-sensing receptor. Unlike other protein hormones, its production and secretion are stimulated by decreased intracellular calcium concentrations, which reflect serum calcium concentrations. PTH exerts its action through the PTH receptor, which is another member of the G protein–linked receptor family. The net effects of PTH activity are an increase in serum calcium and a decrease in serum phosphate. PTH acts directly on bone to stimulate bone resorption and cause calcium and phosphate release. PTH acts directly on the kidney to decrease calcium clearance and to inhibit phosphate reabsorption. By stimulating renal 1-alpha-hydroxylase activity, PTH increases serum concentrations of 1,25-dihydroxyvitamin D, the active form of vitamin D and, thus, indirectly stimulates calcium and phosphate absorption by the gut through the actions of vitamin D. The phosphaturic effect of PTH offsets the increases of serum phosphate driven by increased bone resorption and GI absorption. Hypoparathyroidism results in loss of both the direct and indirect effects of PTH on bone, the kidney, and the gut. Calcium and phosphate release from bone is impaired, calcium absorption from the gut is limited, calciuria develops despite hypocalcemia, and retention of phosphate from the urine causes increased plasma phosphate levels. The incidences of idiopathic hypoparathyroidism and pseudohypoparathyroidism (PHP) have not been determined in the United States. Rates following surgical procedures such as thyroidectomy vary depending on the extent of the surgery and experience of the surgeon. In Japan, a recent survey found the prevalence of idiopathic hypoparathyroidism to be 7.2 cases per million people and the prevalence of PHP to be 3.4 cases per million people. Complications of hypoparathyroidism result from hypocalcemia. Neurologic: Neuromuscular irritability, paresthesias, muscle cramping, tetany, or seizures. However, patients can be asymptomatic. Neck muscle cramping can cause dystoniclike neck movements. Cardiac: Prolongation of the QTc interval. 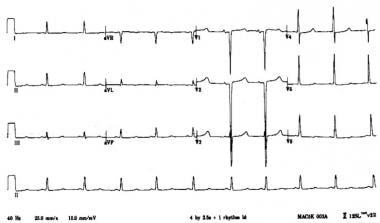 Affected individuals may be asymptomatic or experience syncope, seizure, or death due to arrhythmias, such as polymorphic ventricular tachycardia. Respiratory: Laryngospasm, a form of tetany, can lead to stridor and significant airway obstruction. Hypoparathyroidism is equally prevalent in males and females. Age of onset depends on the etiology of hypoparathyroidism. Transient hypoparathyroidism is common during the first few days of life in preterm infants, infants of mothers with diabetes mellitus, infants of mothers with hypercalcemia, and infants with a prolonged delay in parathyroid gland responsiveness. Transient hypoparathyroidism in newborns usually presents with hypocalcemia; however, it can recur during the adolescent period as seen in some patients with DiGeorge Syndrome. In general, patients with DiGeorge syndrome present during the first few weeks of life. In patients with velocardiofacial syndrome (DiGeorge variant) and autoimmune and PTH resistance syndromes (pseudohypoparathyroidism), hypocalcemia tends to present as late as adolescence. Roth KS, Ward RJ, Chan JCM, Sarafoglou K. Disorders of calcium, phosphate, and bone metabolism. Sarafoglou K. Hoffman GF, Roth KS. Pediatric endocrinology and inborn errors of metabolism. 1st ed. New York, NY: McGraw Hill; 2009. 619-64. Baumber L, Tufarelli C, Patel S, King P, Johnson CA, Maher ER, et al. Identification of a novel mutation disrupting the DNA binding activity of GCM2 in autosomal recessive familial isolated hypoparathyroidism. J Med Genet. 2005 May. 42(5):443-8. [Medline]. [Full Text]. Mannstadt M, Bertrand G, Muresan M, Weryha G, Leheup B, Pulusani SR, et al. Dominant-negative GCMB mutations cause an autosomal dominant form of hypoparathyroidism. J Clin Endocrinol Metab. 2008 Sep. 93(9):3568-76. [Medline]. [Full Text]. Shiohara M, Shiozawa R, Kurata K, Matsuura H, Arai F, Yasuda T. Effect of parathyroid hormone administration in a patient with severe hypoparathyroidism caused by gain-of-function mutation of calcium-sensing receptor. Endocr J. 2006 Dec. 53(6):797-802. [Medline]. Bollerslev J, Rejnmark L, Marcocci C, Shoback DM, Sitges-Serra A, van Biesen W, et al. European Society of Endocrinology Clinical Guideline: Treatment of chronic hypoparathyroidism in adults. Eur J Endocrinol. 2015 Aug. 173 (2):G1-G20. [Medline]. Winer KK, Sinaii N, Peterson D, Sainz B Jr, Cutler GB Jr. Effects of once versus twice-daily parathyroid hormone 1-34 therapy in children with hypoparathyroidism. J Clin Endocrinol Metab. 2008 Sep. 93(9):3389-95. [Medline]. Liu MJ, Li JW, Shi XY, Hu LY, Zou LP. Epileptic seizure, as the first symptom of hypoparathyroidism in children, does not require antiepileptic drugs. Childs Nerv Syst. 2017 Feb. 33 (2):297-305. [Medline]. Ahonen P, Myllarniemi S, Sipila I, Perheentupa J. Clinical variation of autoimmune polyendocrinopathy-candidiasis- ectodermal dystrophy (APECED) in a series of 68 patients. N Engl J Med. 1990 Jun 28. 322(26):1829-36. [Medline]. Arnold A, Horst SA, Gardella TJ, et al. Mutation of the signal peptide-encoding region of the preproparathyroid hormone gene in familial isolated hypoparathyroidism. J Clin Invest. 1990 Oct. 86(4):1084-7. [Medline]. [Full Text]. Chattopadhyay N, Mithal A, Brown EM. The calcium-sensing receptor: a window into the physiology and pathophysiology of mineral ion metabolism [published erratum appears in Endocr Rev 1996 Oct;17(5):517]. Endocr Rev. 1996 Aug. 17(4):289-307. [Medline]. [Full Text]. Chinnery PF, Turnbull DM. Mitochondrial medicine. QJM. 1997 Nov. 90(11):657-67. [Medline]. [Full Text]. Farfel Z, Bourne HR, Iiri T. The expanding spectrum of G protein diseases. N Engl J Med. 1999 Apr 1. 340(13):1012-20. [Medline]. Fischer JA, Egert F, Werder E, Born W. An inherited mutation associated with functional deficiency of the alpha-subunit of the guanine nucleotide-binding protein Gs in pseudo- and pseudopseudohypoparathyroidism. J Clin Endocrinol Metab. 1998 Mar. 83(3):935-8. [Medline]. [Full Text]. Hasegawa T, Hasegawa Y, Aso T, et al. HDR syndrome (hypoparathyroidism, sensorineural deafness, renal dysplasia) associated with del(10)(p13). Am J Med Genet. 1997 Dec 31. 73(4):416-8. [Medline]. Hayward BE, Moran V, Strain L, Bonthron DT. Bidirectional imprinting of a single gene: GNAS1 encodes maternally, paternally, and biallelically derived proteins. Proc Natl Acad Sci U S A. 1998 Dec 22. 95(26):15475-80. [Medline]. [Full Text]. Juppner H, Schipani E, Bastepe M, et al. The gene responsible for pseudohypoparathyroidism type Ib is paternally imprinted and maps in four unrelated kindreds to chromosome 20q13.3. Proc Natl Acad Sci U S A. 1998 Sep 29. 95(20):11798-803. [Medline]. [Full Text]. Levine MA. Pseudohypoparathyroidism: from bedside to bench and back. J Bone Miner Res. 1999 Aug. 14(8):1255-60. [Medline]. Nakamoto JM, Sandstrom AT, Brickman AS, et al. Pseudohypoparathyroidism type Ia from maternal but not paternal transmission of a Gsalpha gene mutation. Am J Med Genet. 1998 May 26. 77(4):261-7. [Medline]. Pearce SH, Williamson C, Kifor O, et al. A familial syndrome of hypocalcemia with hypercalciuria due to mutations in the calcium-sensing receptor. N Engl J Med. 1996 Oct 10. 335(15):1115-22. [Medline]. Perheentupa J. Autoimmune polyendocrinopathy--candidiasis--ectodermal dystrophy (APECED). Horm Metab Res. 1996 Jul. 28(7):353-6. [Medline]. Pollak MR, Brown EM, Estep HL, et al. Autosomal dominant hypocalcaemia caused by a Ca(2+)-sensing receptor gene mutation. Nat Genet. 1994 Nov. 8(3):303-7. [Medline]. Sticht H, Hashemolhosseini S. A common structural mechanism underlying GCMB mutations that cause hypoparathyroidism. Med Hypotheses. 2006 May 11. [Medline]. Sunthornthepvarakul T, Churesigaew S, Ngowngarmratana S. A novel mutation of the signal peptide of the preproparathyroid hormone gene associated with autosomal recessive familial isolated hypoparathyroidism. J Clin Endocrinol Metab. 1999 Oct. 84(10):3792-6. [Medline]. [Full Text]. Yamamoto M, Akatsu T, Nagase T, Ogata E. Comparison of hypocalcemic hypercalciuria between patients with idiopathic hypoparathyroidism and those with gain-of-function mutations in the calcium-sensing receptor: is it possible to differentiate the two disorders?. J Clin Endocrinol Metab. 2000 Dec. 85(12):4583-91. [Medline]. [Full Text].